Terrorism and torture are twin evils that have dominated news headlines - particularly since the horrifying events of 9/11. 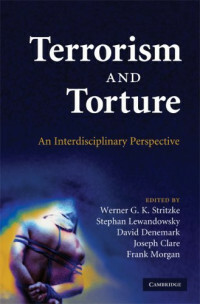 In this thought-provoking volume, scholars from a diverse range of disciplines examine the complex motivational and situational factors contributing to terrorist acts and state-sponsored torture, and the potential linkage between those two heinous human behaviors. They also consider the strategies that might reduce the threat of future terrorist acts, and the perceived necessity to engage in morally reprehensible - and often illegal - torture practices. With its integrated synthesis of contemporary theories and research on the complex dynamics of the terrorism-torture link, this is an authoritative source for scholars and students of psychology, criminal justice, law, media, communication studies, and political science. It will also appeal to students of other disciplines with an interest in the study of terrorism and torture. Embedded computer systems literally surround us: they're in our cell phones, PDAs, cars, TVs, refrigerators, heating systems, and more. In fact, embedded systems are one of the most rapidly growing segments of the computer industry today. What do topics ranging from organic chemistry to Napoleon's campaigns have to do with computer programming? This collection of essays demonstrates the many varied aspects of programming, showing how programming can be both a fun and elegant science. According to an AC Nielsen study conducted in early 2005, as many as 724,000 Americans depend on eBay sales for all or part of their income. But it is becoming more difficult to run a profitable business on eBay, as its sales growth slows and fees increase. Sellers are being squeezed between these two factors.